One of my very favorite foods is ice cream! And nothing says summer like making ice cream. One of my dad's favorite flavors was pineapple. Now that isn't one you are going to find in the market! 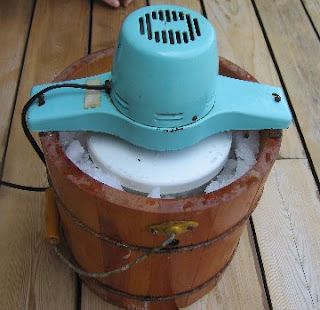 The old fashioned ice cream makers required so much effort, but the new models are sleek and so easy! No ice, no salt, just pop the center bowl in the freezer and pull it out when ready. It is so easy that we could make ice cream every day! And I just might do that. about 15 minutes later it is done! Notice that even Dave is eating GOAT MILK ice cream!!! It is delicious! almost broke his teeth out trying to get to it! haha, dad's picture is hilarious...sign me up for a bowl! Since I know where you get your milk from I am sure it came out great because their goat milk taste like regular milk to me. It is good to have fresh ingredients when making things like this. The only way to eat Goat Milk! So glad it worked! You can borrow the ice cream maker anytime and make a few batches to keep in the freezer for all those "summery days", when you just have to have it! You're welcome to it anytime!